Every site is different and brings with it different challenges. 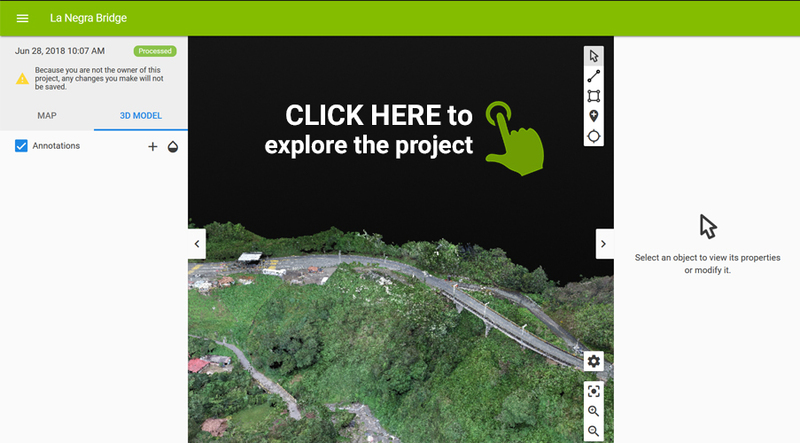 One tool helps planning, monitoring, and documentation: drone mapping. 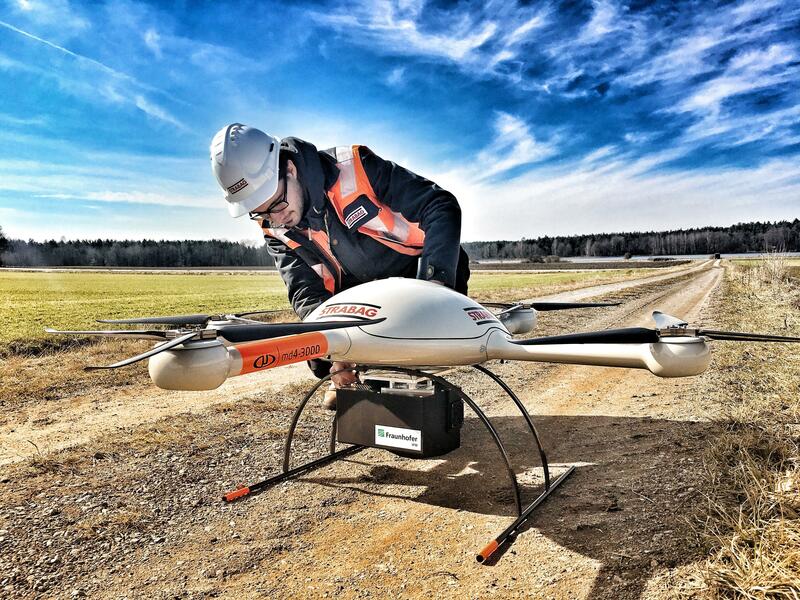 STRABAG, a major Austrian construction company, has been using drones for the last four years and has found that drone mapping significantly saves time and reduces risk. In some cases, the technology also provides results that were never before possible with traditional surveying methods. Headquartered in Austria, STRABAG has over 72,000 employees and offers services worldwide. Their drone division is based in Regensburg, Germany and is focused on mapping infrastructure such as roads and bridges, measuring stockpiles, and monitoring construction sites. The drone division is a team of six people who manage complex, large scale mapping projects all over the world. This scale is achieved in part by training STRABAG’s business units to map projects with their own drones. The business units handle more than 40 projects every month – a number which continues to increase. Results and compatibility with an existing workflow are just two of the factors taken into account when choosing a software solution. It was important to the team at STRABAG that any software would be easy to use, produce reliable results, and be compatible with other software such as CAD and BIM. 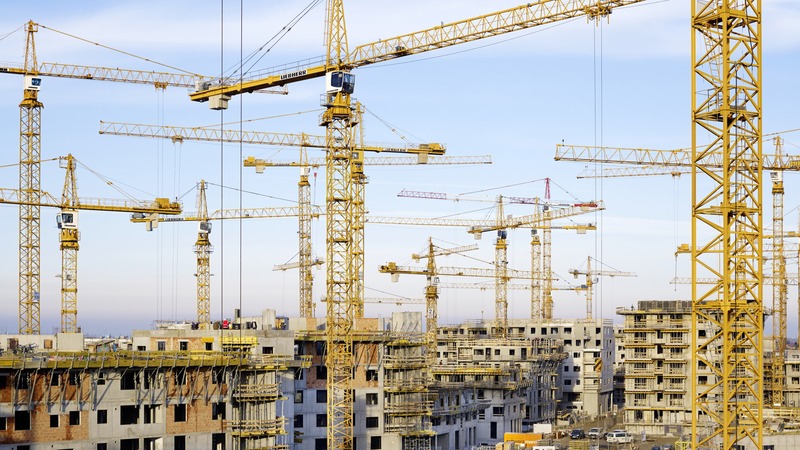 As well as being easy-to-use, the software has to seamlessly integrate with existing construction workflows and scale to handle the ever-growing number of projects. After comparing other software solutions, STRABAG choose Pix4D – “We have many people in our company a smooth workflow is important to us, and Pix4D is one of the easiest software to use,” comments Thomas Gröninger, Head of STRABAG UAV Division. For complex, large-scale projects, the need for accelerated processing times, and streamlined workflows means that Pix4D’s enterprise solutions became the right choice for STRABAG. Pix4D’s processing engine is customized to meet the needs of STRABAG, and hosted on a secure cloud computing server. The teams benefit from higher flexibility and reduced processing times. The state of Antioquia in northwest Colombia is a mountainous and densely forested region. STRABAG has been contracted to plan, build, finance and operate 176 kilometers of motorway winding through this difficult terrain. The Autopista al Mar 1, as the road is known, connects the state capital, Medellin, and the municipality of Bolombolo. The Autopista al Mar 1 consists of 75 kilometers of new road construction, as well as the modernization of 65 kilometers of existing road, a tunnel, plus the reconstruction of over 20 bridges. The bridges are key to the success of the project, yet technical details were sparse. To map the everything (including foundations, pillars, and surrounding terrain), STRABAG turned to drones and Pix4D software. “With drones, we were able to fly around the bridges and get a complete overview of the infrastructure: sides, undersides, and terrain. In the end, you have much more data than what you would get with traditional surveying methods, and everything is done faster,” says Thomas. Bridge foundations and pillars had to be mapped in a free-flight mode with the Pix4Dcapture app. Because both the foundation and pillars were in the area of interest, ground control points (GCPs) had to be placed both horizontally on the road and vertically on the bridge pillars. In addition, there was no GNSS connection network, meaning that GCPs had to be measured using total stations. The area had very dense vegetation which had the potential to generate inconvenient noise and artifacts on the 3D point clouds. However, with Pix4D’s rayCloud solution, it is easy to edit the point clouds and generate accurate models. 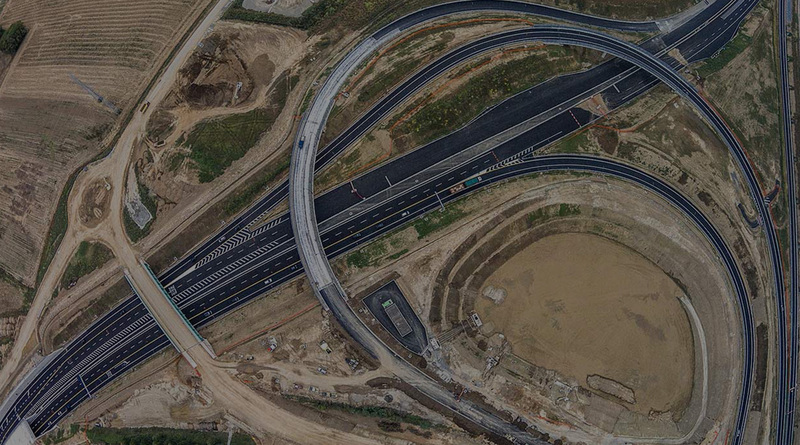 All the images collected were processed with Pix4D mapping software and generate accurate and highly-detailed 3D models of the existing bridges and georeferenced orthophotos of the surrounding area (resolution or the ground sampling distance (GSD) of 1.2 pixels per centimeter). The 3D models helped the team visualize in details the areas of interest and subsequently efficiently plan the construction project with precise measurements and volume calculations. They vectorized the 3D point clouds to get bridge lines and used the generated DTMs to compute volumes. 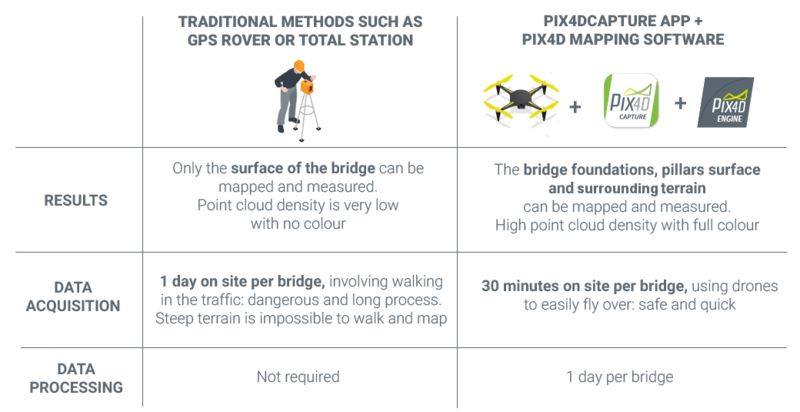 For STRABAG, Pix4D software streamlined the process and reduced the time required to map each bridge. “In comparison to other photogrammetry software, Pix4D proved to be faster. Its integrated automatic features such as the automatic GCP marking which significantly decrease manual processing times. Other software was tested in previous projects but proved to be slower or had problems aligning complex structures such as bridges,” confirms Thomas. Pix4D drone mapping software represent a huge upgrade from the traditional methods of land surveying. Using drones for this project not only saved time and money but also measured what would otherwise be impossible to measure at all. As we have already analyzed, few industries are as complex or potentially dangerous as construction. When it’s complete, the Facility for Antiproton and Ion Research in Darmstadt, Germany, will be one of the largest and most complex particle accelerators in the world. The centerpiece will be a ring accelerator with a circumference of 1,100 meters. Construction of the ‘FAIR Ring’ is only one part of the project. This four-year project involves ten countries so easy and efficient earthworks monitoring is essential. To have up-to-date data and be able to calculate volume changes over time, STRABAG flies drones over the area at the end of each month. They process collected images with Pix4D software to compute Digital Terrain Models (DTMs) and calculate volumes to estimate changes. These changes can be easily shared with stakeholders, such as project managers and contractors. It also serves as a record of the project, as well as documenting that work is progressing on time and according to plan. Drones and Pix4D represent a significant time saving, delivering results up to 80% faster than traditional methods. A single survey using standard techniques would take approximately two weeks. However, with a drone, STRABAG can fly the area in one day and process images in another. “We need two days in total for flying and processing compared to two weeks — that is why we are using drone technology. We save a lot of time, and the accuracy is good,” explains Thomas. Kenya’s Thiba dam will change the face of the region. With a secure, year-round water supply, a second harvest every year will be possible. Before construction could begin, STRABAG had to map 8 square kilometers of the area surrounding the dam. Using drones was the most efficient and cost-effective way to get an aerial overview, and create 3D models of the terrain. To accurately map this large-scale project and acquire georeferenced data, STRABAG placed a number of GCPs. But they immediately ran into a challenge: measuring the GCPs. Spraying marks on the ground for GCPs was then impossible as heavy rain fell each morning, erasing the marks, meaning that data collected one day could not be reliably compared to data collected the next. rayCloud photogrammetry software allows users to connect the original images to each point of the 3D reconstruction to visually verify and improve the project accuracy. The team found a solution by building GCPs made of concrete which finally enabled them to obtain the measurements and to be confident in their accuracy. The process of building and measuring GCPs lasted three weeks – yet once the GCPs were in place, it only took three days to fly and collect images of the whole area. The large number of images took the team a week to process with Pix4D. Because the GCPs marking process proved so challenging, STRABAG decided to search for a more time-efficient solution and recently trialed PPK-Direct Georeferencing system with their drones. “This GPS system is in great compatibility with Pix4D software. We tested it, and we got very good results. You don’t have to compute calibration on Pix4D anymore. You have GPS information embedded in the image file with an accuracy of better than two centimeters. We can then reduce our GCPs and in the future save a significant amount of time. For instance, on this project - we would not need 100 GCPs anymore but only 20,” explains Thomas. At first glance, the projects featured here are very different, in scale, complexity, and location. 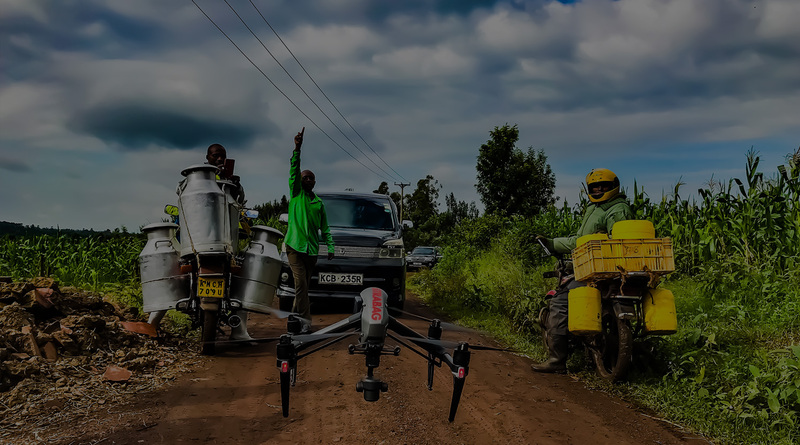 Yet for the most efficient collection and processing of data, STRABAG relies on the same toolbox: drones and Pix4D drone mapping software. 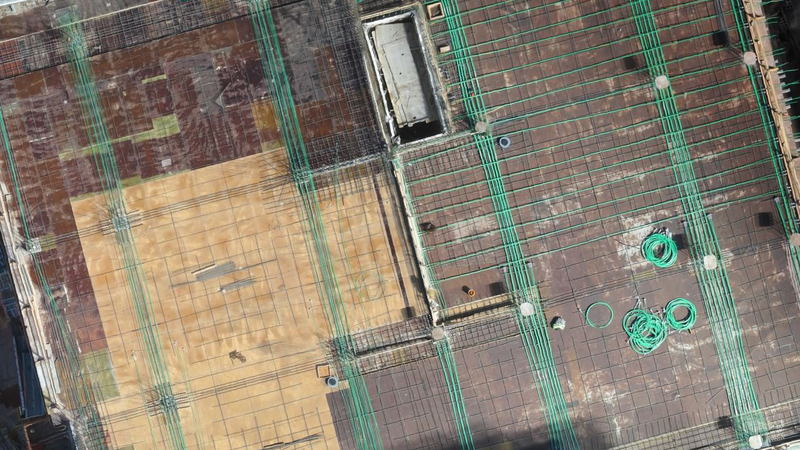 Ready to try Pix4D software on your construction projects?